A few hours ago, the PLDT service man gone to our home to fix the problem with our land line phone. I called their customer service yesterday and I was told that their service man will fix the problem that I reported today. The problem that we have experienced with our land line are intermittent static problem, sometimes the phone didn’t receive incoming call and the worst is having no dial tone at times. The service man done some testing with the lines and he found out that our handset is the problem. Automatically, he replaced it with the new PLDT handset. There is no charge for the replacement of the handset. Aside from that he gave me a postpaid sim for the PLDT landline Plus because I also ask him about it. According to the customer service of PLDT, there will be an additional Php 250 to the regular bill of our land line if I activated the postpaid PLDT land line. I decided not to activate since I prefer the Landline prepaid. The service of the PLDT is very good that they have fixed the problem right away. 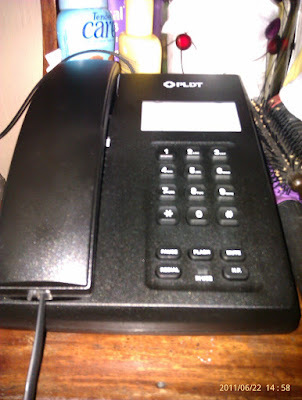 This is the first time that we have our PLDT land line service repair for almost many years ago. This entry was posted in Review and tagged landline service review PHilippines, PLDT landline service review, PLDT service. Bookmark the permalink.